To know where we are going, sometimes we have to look back over where we have been and review what we have learned along the way. Everyone says that 2013 is going to be a year of change for the healthcare industry...more change than what we have seen and experienced over the past couple of years? For NCHN, we are looking at change and considering how we can do it in a positive manner and for the betterment of the Association. Sometimes we can and sometimes we just have to accept the change and move along. As Network Leaders, you are also dealing with change and I am reminded of the saying, "The only thing that is for certain is that there will be change!” We must constantly adapt. So, today I would like to share some changes here at NCHN. First of all, we are discussing the option of moving the NCHN Weekly Digest to a biweekly publication vs. the weekly you currently receive each Tuesday morning. In reviewing the history of why we started the Weekly Digest, it ties directly to the passage of the Affordable Care Act. We were receiving numerous notices and updates about the new law and we were passing them along so often that we started hearing "Enough is enough. Quit sending out so many emails each week – put them into a weekly report or something!” We listened and thus on August 9, 2010 the NCHN Weekly Digest was launched. Over the course of the past two years the readership of the Weekly Digest and month eNews has averaged about 25% of the folks receiving it actually opening it. Of course, we don't know who is actually reading it! We started tracking the open rates by groups and are happy to report that since October 2012 the open rate among NCHN members has increased to an average of 37.3%. So, tell us: is it time for another change with the NCHN electronic publication? Would you the members and our guests that read the Weekly be just as happy with a bi-weekly publication? And maybe a quarterly eNews vs. the current monthly eNews publication? Is this a change that NCHN should make, or should we leave things the same? You tell us – please send your comments and thoughts to either Rebecca or Christy. We would love to hear from you! And we might even buy a cup of coffee or tea for someone that sends us their thoughts. Each year, a number of seats on the NCHN Board of Directors are open for elections. This year we have four Director positions that are open for elections. Board Directors are elected by you the membership! But in order to be elected, folks must submit their name and the required information that is discussed later in this newsletter. We are looking for a few good Network Leaders to step forward and submit their names for consideration to serve as a Director of NCHN. Please take a minute and think about who would be a great Director for leading NCHN into the future – and if it is you, please do not hesitate to nominate yourself today! Each month, NCHN offers a Coffee/Tea Chat with Dr. Chess. I challenge you to reserve and protect this time on your busy calendars and begin participating in this membership benefit in 2013. This is your time – do it for yourself and for the good of your network. This is the one opportunity, once a month, that you can connect with your peers across the nation, share you successes and challenges, ask for support, comfort and feel the love of other Network Leaders for the work you are doing. Take advantage of this opportunity. The next Coffee/Tea Chat is on Wednesday, February 13 @ 12:30 PM ET. More details are so located below. Any new members accepted will follow the new dues structure and their dues will be prorated for the remaining months of 2012-2013 fiscal year. NCHN fiscal year is May – April and the 2013-2014 dues assessments will be conducted in the spring of 2013. And now, a change that I am not looking forward to in 2013! Synernet, one of our founding members, has provided NCHN with Administrative Assistant Services since our inception back in 1995. I am sad to report that at the end of this month that arrangement will be ending. What this means to NCHN as an Association and to you as members is that Debbie Comeau will no longer be working with NCHN. I, along with the NCHN Directors & Officers thank Debbie for her service and years of dedication to NCHN. We wish her the best and will miss her at NCHN events! Debbie Comeau (pictured left at the 2012 NCHN Conference in Denver) has served as the Administrative Assistant for NCHN since we officially became an Association back in 1995 when 13 different health network organizations held the first official meeting of NCHN in Tempe, Arizona. 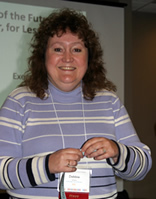 Since 1995, Debbie has worked with the Board of Directors and Annual Conference Planning Committee. She has attended almost every NCHN Annual Educational Conference, participated on the Executive Committee and Board calls and be the keeper of NCHN’s historical information and identity. She is one of the few individuals that have been involved with NCHN and our activities for the past 19 years. Debbie is employed at Synernet, one of NCHN’s founding members, and over the years her job has changed and she has moved into Human Resource Management for the network. With the growth in this area and demands on her time, she felt it was time to end her official relationship with NCHN. We, the staff, directors, officers, and members will miss her, but we thank her for her continued support and dedication to NCHN over the years. Welcome to the February, 2013 Coffee and Tea Chat with Dr. Chess. During our conversation in January, we considered "boards" and how to define board roles, how to support the creation of board-specific strategic plans and how to encourage on-going board development. And, we were pragmatic about how much time board members actually have available for this level of engagement. During our February chat, we will switch the focus to network leader development. There is that wonderful reminder we always hear when flying...in the event of an emergency, put the air mask on you first..
We'll consider "air masks" and network leader roles and development in February. Call in information was distributed through a Save the Date notice from Rebecca. If you need or have questions, please let her know. The NCHN Board of Directors approved two new Business Partners on their Board call on January 21, 2013. We are pleased to announce the addition of Virtual Care Works, Inc., and LoneStart Now as Silver Level Business Partners. Virtual Care Works, Inc., partnership will afford NCHN members with the provision of secure Internet and guaranteed bandwidth supporting a unified communication platform. The partnership will enhance the Telehealth efforts of quality, access, and cost reduction for NCHN members. LoneStart Team Esteem Challenge is designed to instill the essential sense of self-belief necessary for enduring behavior change by creating a realistic opportunity, reinforcing modest but meaningful improvements in daily lifestyle choices and providing a supportive environment where healthy behaviors are learned and adopted, shared and sustained. More details about their program and services will be forthcoming within the week. NCHN is a membership organization and thus is governed by a Board of Directors that is elected by the membership. Serving as a Director of NCHN is an excellent opportunity to expand your leadership skills, interact on a regular basis with your peers, and give back to the Association! The National Rural Health Association (NRHA) is pleased to announce the winners of its 2013 Legislative Awards, which recognize outstanding leadership in rural health issues by both members of Congress and congressional staff. New funding to help eight states of the Delta region address chronic health diseases was announced today by Mary Wakefield, Ph.D., R.N., administrator of the Health Resources and Services Administration (HRSA). Up to $5.6 million in the first year will focus on managing three health risks—diabetes, cardiovascular disease, and obesity—that disproportionately affect the Delta region. Only 15 percent of rural and exurban counties had median family incomes that were at or above the national median of $50,502 in 2011. A new study suggests that “e-visits” to health-care providers for sinus infections and urinary tract infections (UTIs) may be cheaper than in-person office visits and similarly effective. Alvin Hoover, CEO of King's Daughters Medical Center in Brookhaven, MS, took the reins this month as chair of the American Hospital Association's Section for Small or Rural Hospitals in 2013. The 24-person governing council represents small or rural hospitals in the AHA's policy process and member services initiatives. Hoover spoke recently with HealthLeaders Media about the challenges that small and rural hospitals will face in the coming year. National Public Radio, using information from Planet Money, has created a nice graphic displaying the rate of work-related, on-the-job deaths in 2011 for U.S. workers using Bureau of Labor Statistics data. At least two jobs that take place in rural areas made the four deadliest: logging, second, and farming or ranching, fourth. My first mentor, and now long-term dear friend, always said, “a plan is better than no plan.” This is probably the best advice that I have ever received in my professional life. I have always kept his words in mind when taking on any project. After working with this mentor for almost six years, I always make a plan for just about everything. The advanced use of electronic health records is starting to accelerate in hospitals, mainly because of the government's EHR incentive program, concludes a new analysis of HIMSS Analytics' Electronic Medical Record Adoption Model (EMRAM) scale. According to a new University of Virginia study, half of the 50 states could end their primary care physician shortages, and save billions annually in health care costs, by a simple policy change: equalizing the licensure requirements for foreign-educated physicians and U.S.-educated physicians. Funded by the ACA, it offers medical residents the opportunity to practice primary care as part of an interprofessional team. Most Americans want quick action to reduce the deficit, but almost six in 10 oppose cutting Medicare spending to achieve that goal, according to a new poll released today.